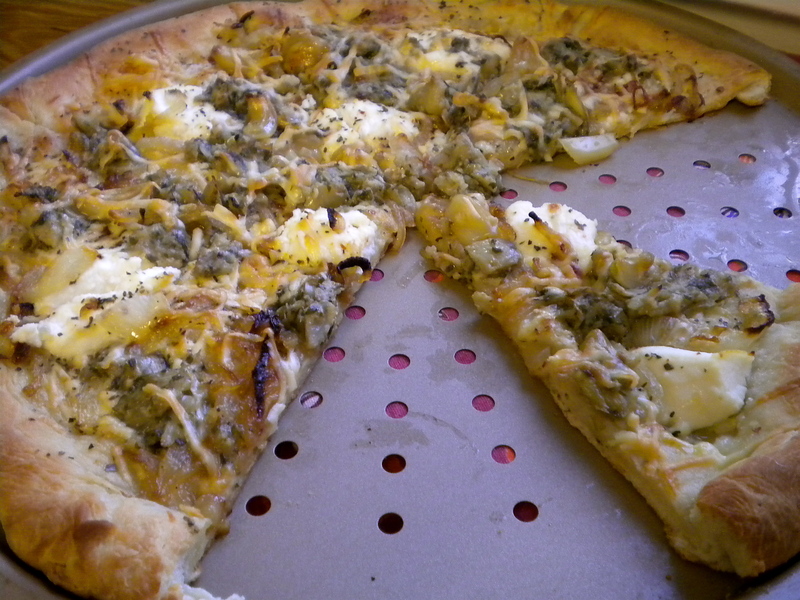 Caramelized Onion, Roasted Garlic and Artichoke Pizza – Voila! Pizza is great for experimenting with different flavors, ingredients and combinations. When you get home from work and you just don’t feel like making a big deal out of dinner, homemade pizza is the perfect meal. It’s quick, it can be as gourmet or as simple as you like and it tastes so good! This blending of flavors is light yet deeply flavorful and savory. What’s your favorite impromptu pizza recipe? Share in the comments below! 1. Rollout pizza dough and place on pizza stone. Pour 1-2 T. olive oil on crust and brush to coat evenly. 2. Cut 1/2 inch off the top of garlic head. Place in small square of tinfoil. Pour 1-2 tsp. olive oil over garlic head. Wrap the garlic with foil and place in oven. Let roast for about 35 minutes. Remove form oven and let cool. Once cool, remove garlic cloves from skin, set aside. 3. Meanwhile, heat olive oil in skillet over medium heat and sautee for about 15 minutes. Sprinkle with a pinch of sugar. Once sauteed and the onions are caramel color, set aside and get ready to assemble pizza. 3. Sprinkle pizza with layer of pecorino romano. Spoon 6-7 T. ricotta cheese strategically around the pizza. Sprinkle with red pepper flakes and basil. Evenly spoon onions over cheese. Place whole garlic cloves around the pizza. Add 4-5 T. of artichoke topping evenly around the top. Sprinkle a little more pecorino romano and bake for 20 minutes. Wow thanks! This is definitely a winner. I found the artichoke pizza topping in the isle with the pasta sauces. Good luck and let me know how it turns out! I’m a huge fan of Trader Joe’s pizza dough in a bag. it’s so cheap, I can roll out as much as I want, and it takes less than ten minutes to cook! Fave combo (at the moment): tomato sauce, those tiny balls of fresh mozzarella (bocconcini? ), artichoke, and some good olives. I’ve gotten my roommate hooked and he is all about the pineapple pizza.